A great new web site with detailed information on UK Hardy Boys editions! 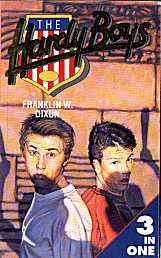 The first regular title in the main Hardy Boys series was published in Great Britain in hardback in 1950. The 87th - and last - main series title was published in paperback only in 1991. The last four titles have appeared in paperback only, while one title and several of the revised text editions have never been published in Britain. But it's not as simple as that. 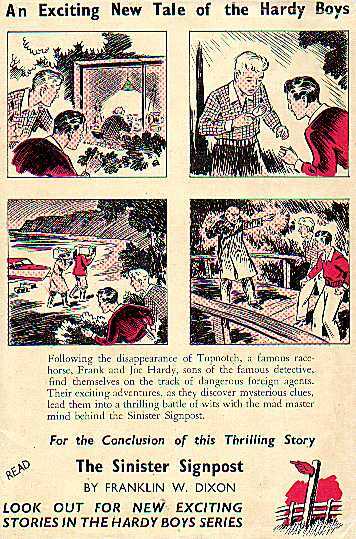 The history of The Hardy Boys published in Britain has been difficult to chronicle but I have done the best that I can using what information there is available. My research has been greatly assisted by reference to the British National Bibliography, which is released on an annual basis, and gives details of books -both new and some reprints - published in any given year. HARDBACKS All Hardy Boys books published from 1950 to 1969 were Hardback with dust-jacket. Picture Cover-style (PC) bound books were first introduced in 1971 and continued until 1986 when the last Hardback edition was published. From that year on all new Hardy Boys titles were issued in paperback only. The first publishers were Harold Hill & Sons Ltd of Newcastle Upon Tyne. The first book was The Secret Of The Lost Tunnel, a single volume released in the same year as the American edition (1950). It would appear that this title was published simply to test the UK market. Sales were obviously sufficient to warrant other titles being published the following year. The first three books utilised the same dust-jacket artwork as the American editions but with yellow spines instead of the wrap-around art. The subsequent 14 titles had new artwork, by Frank Varty, who also painted the cover for the 1957 reprint of Lost Tunnel. The back of the dust-jackets for the 14 Varty covers feature a brief synopsis accompanied by four small pictures illustrating exciting scenes advertising the next book. Although The Sinister Sign post would eventually be published by another company, the back of The Hidden Harbour Mystery advertises this next book. Also, the series listings on the inside dust-jacket flap has the titles of all the books published in America at the time, even though the other volumes had not yet been published in Britain. The bindings of the Harold Hill books were dark blue for the 1950 and 1951 printings, and cream for the 1953 printings. For later books and reprints, the colour of the cover cloth appears to be whatever was available at the time rather than by any specific planning. Brown was used on What Happened At Midnight only, with orange for the remaining four titles. Some later reprints of the books were in different colours (for instance I have both an orange and a green Footprints Under The Window, and a The Secret Of The Caves and The Shore Road Mystery that is blood red). On the cover and spine for The Mark On The Door, the first "The" is missed off. 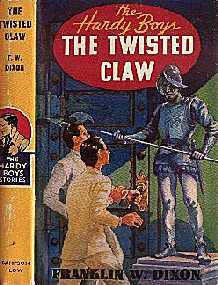 Interestingly, some of the orange covers omit the name Harold Hill at the bottom. The books all feature the black silhouette of the two boys on the cover, with the Gretta orange 'tree' endpapers. The frontispieces were generally the same as the American editions but some 1951 titles, i.e. The Great Airport Mystery, feature a brand new drawing. There are no internal illustrations in the Harold Hill editions. The texts were generally Anglicised (eg Harbor changed to Harbour) meaning that the books had to be totally re-type-set from the Grosset & Dunlap printing plates. The books are listed below in the order based on the books' serial number (S/N). For reasons unknown, Harold Hill lost their publishing rights to the books in 1958 despite apparent plans to publish The Sinister Sign Post, as seen on the back cover of The Hidden Harbour Mystery. The new publisher, Sampson Low of London, bought the rights and released the next 26 titles. As before, all the books were Anglicised and the text was fully type-set again, but the dust-covers and frontispieces were the same as the American editions, i.e. The Secret Warning does not have a frontispiece. From 1963 onwards the books contained internal illustrations for the very first time in any British edition. These were generally the same drawings as in the American editions or, in a few cases (i.e. The Ghost At Skeleton Rock), very close recreations. The cover boards of all the Sampson Low books were red with the black silhouette of the boys. There are a couple of printing errors with the titles: The Secret of Pirate's Hill and The Ghost At Skeleton Rock appear on the front and spine bindings of those books, but the correct spellings appear elsewhere. The end papers are blank for the first three years but from 1963 the orange Gretta 'tree' scene was used. As with their American counterparts, the spine on the first SL books was plain yellow, and for the 1961 and 1962 editions the spine was yellow with a blue and white stripe. The Sinister Sign Post is the only exception; this had the wrap-around Gillies cover, the only British printing to use this dust-jacket format. From 1963 the blue spines and cover art were the same as the later blue American Picture Cover editions, but in dust-jacket format. All titles were original text editions. At least one title, The Short-Wave Mystery, is known to be the revised text version. All the SL books have a number at the base of the spine. On the yellow spines, this number reflects the US numbering, but on the blue spines, the number bears no association to the ususal numbering, or the ISBNs. The numbers, where known, are indicated below. Mystery Of the Desert Giant was also published, year unknown. In 1968 Sampson Low became MacDonald and continued to release Hardy Boys in the same blue dust-jacket and binding format where the SL editions left off. Titles below marked with "(rev)" are known to be revised text editions. The book numbered #1 in this series is The Sinister Sign Post. Oddly, although the MacDonald edition has the Nappi reprint cover with the racing car, it is in fact the original text. 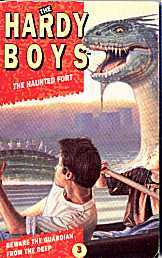 Since The Sinister Sign Post was the "first" book published by Sampson Low, it is named as the boys' first adventure in some of the books. Like the Sampson Low books, the MacDonald editions are numbered on the bottom of the spine. 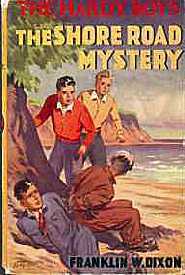 In 1970, following the success of Malcolm Saville's Lone Pine Adventures series, The Three Investigators and Tom Swift Jr. hardback titles published in the late 1960s and early 1970s, William Collins Sons and Co Ltd, London and Glasgow, bought the rights to the Hardy Boys and began to release titles from 1971. The order of the books was completely changed; I have tried to work out a pattern to this new numbering system but it seems to have been done purely at random. This has resulted in some odd continuity: the boys don't get the Sleuth until book #16 and yet they use her in book #14. With the exception of five titles - The Melted Coins, The Secret Of Pirate's Hill, The Flickering Torch Mystery, The Clue In The Embers and The Mystery At Devil's Paw, all the Collins editions are revised text versions. This is odd considering that the revised texts for all five were available in America at the time. The revised texts of these five titles have never been published in Britain. All the books were completely re-type-set. The texts were also edited, Anglicised and modified by Collins in order to remove Americanisms and out-of-date concepts. For example, in the original The Mystery At Devil's Paw the purpose of the missing rocket was to explore the moon, but for the Collins edition, the rocket was for the exploration of "the outer planets". In The Flickering Torch Mystery, a whole paragraph in chapter 7 - in which the San Francisco earthquake is discussed - has been deleted. Further minor changes were made to the text to alter the reference to the previous and next books in the series to reflect the new book order. The books had Picture Cover-type bindings with brand new cover art (by Peter Archer for the first 48 titles) and, in the case of 16 books, they had internal illustrations. The internal illustrations and frontispieces for the first 12 books and volume #26 were based on the same drawings in the American editions, but redrawn by another artist. The style of artwork differs from book to book indicating that various, but unidentified, artists were responsible (although many do match Peter Archer's recognisable style). The title headings on the covers were printed in a variety of fonts and sizes. Most of the books featured plot-descriptions on the first page, usually direct copies of the original American texts. The spines of the first 48 Collins books feature a single illustration from the story (also by Archer). Each book's spine and back cover is a different colour dependant on the dominant colour used in the cover artwork. 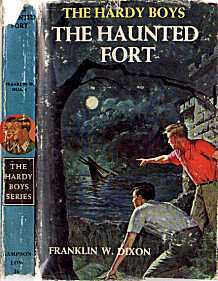 Except for three titles noted below, all titles feature a blue box at the top of the spines with the title "The Hardy Boys Series" followed by the volume number. This text is in white lettering. However, for the first edition hardbacks of The Mystery Of The Aztec Warrior and The Haunted Fort, the box is pink with black writing, and for the first edition of The Arctic Patrol Mystery the box is yellow. Editions of The Disappearing Floor also exist with black lettering in the blue box. The box is blue on subsequent reprints of these three titles. 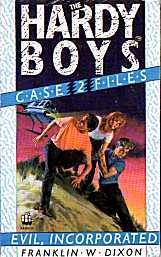 The back covers of the books feature a boxed painting of the boys in profile, then a list of the other titles in the series. The books appear to have been published in batches of eight. First edition copies (and some of the second reprints) are recognisable for having blue edging on the tops of the pages. Also, the number of available titles listed on the back indicates what reprint edition it is: first editions of #1-#12 would list 1-12; #13-#18 would have 1-18; #19-#24 would have 1-24. Later reprints of these early titles list all 36 books, and all subsequent printings of the first 36 titles have 1-42. It is only on volumes #43-48 that all 48 titles are listed. 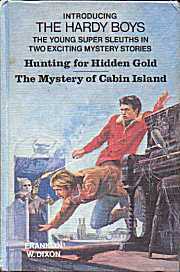 In 1973 a two-in-one was published, with Hunting For Hidden Gold and The Mystery Of Cabin Island in one double volume. 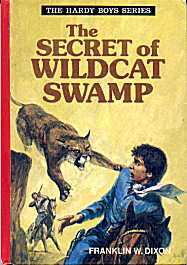 The cover was that from Hunting For Hidden Gold, and the cover header says "Introducing The Hardy Boys" which suggests it was intended as the first book published by Collins, but the copyright date belies this. 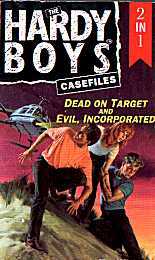 The 1959 version of The Hardy Boys Detective Handbook was published in 1979 by Collins, and The Hardy Boys Survival Handbook in 1981, both being straight reprinting from the American print-plates. The Hardy Boys Campfire Stories was apparently published in hardback in 1986. KEY TO LIST: the first 48 covers were all by Peter Archer. Volumes 49-56 use the American PC format. "(ot)" indicates original text; "(Int)" indicates internal illustrations. The illustration on the spine is listed after the cover description. 12 Collins editions, volumes #37-48, were later reissued by Collins in the mid-1980s at the time that Angus & Robertson were the publishers of the Hardy Boys Hardbacks. The actual year of publication is unknown as the books still retain the original publication dates on the copyright page. While the original editions were printed in England, these books were printed in Italy by Imago/Sagdos. The paper stock used is much thinner making the dimensions of the books smaller. The cover artwork was the same as the original Collins editions, but the spines (minus the small illustration) and back covers were blood red on all volumes. The backs simply listed the titles, saying these books are now "back in print in twelve hardback adventures". ANGUS & ROBERTSON In 1979, the American publishing rights of the series moved to Simon and Schuster. As a result, the publishing rights to the British editions moved from Collins to Angus & Robertson, an international company that was based in the UK but had distribution offices in Australia, Manila and Singapore. Collins, however, retained the rights to publish all future books in paperback only under their Armada Books imprint. 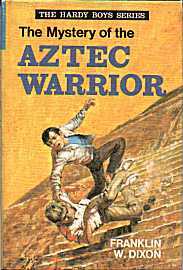 The Angus & Robertson Hardbacks were printed directly off the type-plates made for the American Wanderer/ Minstrel paperback editions, with the same internal illustrations. The dimensions of the cover bindings of the Angus & Robertson books is vastly different to Collins. Plot descriptions now featured on the back cover, which featured a head and shoulders illustration (by Peter Archer) of the boys. For the first time, the cover artist was credited. British artists Peter Archer and Dave Godfrey provided new cover art, while the existing American covers by Derek James and Richard Williams appeared on the last few volumes. It appears that volumes 77 and 78 were not published. This is based on the fact that later volumes do not include these two titles in their 'also available' lists, plus I have been unable to locate a copy. 1983 The Four-Headed Dragon 67 ? Note: The last five Angus & Robertson books use the same cover artwork as that used on the original Wanderer/Minstrel US paperback editions. Angus & Robertson apparently also published a hardback edition of the first Supersleuths book in 1982. While Collins is the hardback publishing body of William Collins & Sons Ltd (today called HarperCollins Publishing Group), the group has several imprints in charge of specialised publishing. Fontana Paperbacks is the main division in charge of paperbacks, which in turn is divided up into sub-divisions which deal with specific categories. Armada is the branch of Fontana in charge of children's books. Armada is the division that published the Hardy Boys in paperback. The publishing history of the UK Hardy Boys paperback editions is very complex. And given the apparent randomness in which the books were published by Armada, and the numerous styles of cover layout and artists used during the period of 1974 to 1993, it is hard to determine exactly how many titles were reprinted in each format. I have written to the publishers asking for help with this but they were unable (unwilling?) to comply. The following guide is therefore very much a work-in-progress. Some early titles have four different covers, while some have only the one. Only two titles, The Melted Coins and While The Clock Ticked, are known to have been published with five different cover formats. All the Collins and Angus & Robertson hardback editions - volumes #1-76, #79-83 - have been published by Armada. There are however 87 titles in the UK series; with Sky Sabotage (#77), The Roaring River Mystery (#78), The Mystery Of The Silver Star (#84), Programme For Destruction (#85), The Sky Blue Frame (#86), and Danger On The Diamond (#87) making up the other titles to complete the set of 87 books. The numerical anomaly when compared to the American numbering is that three titles, The House On The Cliff and The Hidden Harbour Mystery and the new book Tricky Business (US#88) have never been published by Collins or Armada. The existing type-plates from the hardback volumes #1-48 and #57-83 were used for all the paperbacks. When it came to volumes #49-56, which were taken from the American Grosset & Dunlap Picture Cover editions, the books had to be type-set again from scratch, and as such there are no frontispieces or internal illustrations. The order in which the books were published in paperback was variable. Volumes #1-9 were published first, followed by #19-22, then #11-12, and back and forth between numbers. The numbers then jumped to #57-64, then back to #29, then back to #65, and so on, on a random basis, until all 83 hardback titles had been published in paperback form. The reason for the jump from #28 to #57 was for contractual reasons between Armada and Angus & Robertson; Armada was obligated to publish the more recent titles first, and the re-setting of titles 49-56 obviously delayed those books. The first paperback editions for #1-32 (but not 10) and #57-64 used the same cover artwork by Peter Archer as on the Collins hardbacks, but for all the other titles brand new artwork was commissioned. The names of these other artists are not known. Danger On The Diamond is the last paperback in the series published by Armada. In 1983, at least 21 titles were issued with new ISBN codes. It is not readily clear as to why this was done, as new ISBNs are usually only adopted when a book is modified in some way other than just a new cover design. The known books with new ISBNs are volumes 1, 5, 7, 8, 9, 10, 12, 13, 17, 18, 19, 20, 21, 22, 23, 24, 25, 26, 27, 29, 30. There have been some changes to the paperback titles, with #5 being renamed The Mystery Of The Disappearing Floor, #7 is The Mystery Of The Melted Coins, and #32 is The Mystery Of The Missing Friends ("Chums" being deemed an American term); and #72 is now The Tic-Tac Terror. Programme For Destruction is an Anglicised version of the title. Other titles have an extra "THE" added to them, such as The Mystery Of The Whale Tattoo, and The Mystery Of The Desert Giant. The logo on these editions is a white or black rounded upper case font, left-justified. The logo on The Mystery Of The Whale Tattoo is, however, right-justified. For new editions from 1980, starting with The Hooded Hawk Mystery, the font was altered slightly, and is thinner than the original. The same artwork by Peter Archer from the Collins Picture cover hardback editions was used, with one exception - The Disappearing Floor. It is clear that although the scene is the same, brand new artwork copying the hardback art has been used for the paperback. In fact, on very close examination of the paperbacks, it is clear that the publishers did not have access to the original artwork, and so they simply painted over the hardback covers to block out the titles. This is most evident on The Secret Of The Caves and The Clue In The Embers in which parts of the original title can still be seen 'under' the new paint on the top third of the illustration. All the paperbacks to some degree have 'new detail' in this area. The first 32 volumes, but not #10 (see below), were published from 1974 to 1982, and volumes #57-64 from 1981 to 1982. In 1978, reprints of earlier titles first appeared with a number on the spine. In 1980, volume #29, The Hooded Hawk Mystery was the first new title paperback to feature a numbered spine (the number appears on the back of all editions as well), and from 1980 all subsequent books (new and reprints) have a numbered spine. Some books have had three printings under this format. The first paperback editions of Footprints Under The Window and The Crisscross Shadow were published with the incorrect volume number on the back: Footprints Under The Window with 24 instead of 23, and The Crisscross Shadow with 23 instead of 24. The numbers appear only to have been corrected on the 1980 reprints. While The Clock Ticked does not appear to have been published in this format (in over 20 years of collecting I have never seen a copy), so its first paperback edition would be Format F.
This cover style uses the same font and logo as Format B, but with the cover borders and spines in colour instead of plain white. The first edition titles published under Format C were volumes 73-83 (1984-1987), and volumes 35-40 (1984-1985). A new artist (name unknown) did all the first edition covers in this format. This new artist also produced covers for reprints of earlier titles during 1984 and 1985: 1,3,4,6,8,12,13,17,26,29,30. Several of the Format B covers were reprinted during 1984 and 1985 using the existing artwork, but with a colour border or background replacing the white: known recoloured volumes are 7,10,20,25,33,34,65,71,72 - these are indicated with a (C) in brackets in the list below. The logo for this range is a 'neon-sign' style font over a shield coloured like the American flag. There were 16 paperback first editions from 1987-1991, plus several reprints of earlier titles during 1987 and 1988. Volumes 6 and 8 also appear in Format D, but the artwork used is the same as that on Format C.
Due to an initial printing error, The Arctic Patrol Mystery and first appeared with the other's cover artwork. These were corrected for later Format D reprints. Interestingly, Danger On Vampire trail is titled Danger On The Vampire trailon the title page. The fifth and final artwork cover style features a logo at the top of a coloured strip, which runs down the left half of the cover which is 'torn' across the middle. There were only two firsts in this style in 1991 (volumes 86 and 87), the others books being reprints of earlier titles. The one artist, name not known, painted all the covers that appeared in this format. CHECKLIST The following is a quick reference guide to the book cover formats on a per volume basis. Please note, the guide only lists whether or not the book exists in this cover format; it does not list all multi-printings of the same cover format. For instance, I have not listed the post-1980 Format A reprints with the volume number added to the spine. And some Format C first editions have a bottom corner flash that reads "New In Paperback", which is replaced with "An Exciting Adventure" on subsequent Format C reprints of the same title. Note: all the titles listed here are given exactly as it appears on the cover / spine / titlepage, including extra "THE"s or alternative spellings. A - same as hardback 1979? Other books released by Armada were The Hardy Boys And Nancy Drew Meet Dracula And Other Stories (featuring novelisations of three TV stories: "…Meet Dracula", "The Haunted House" and "The Flickering Torch Mystery"). This had a photographic montage cover featuring Shaun Cassidy, Parker Stevenson and Pamela Sue Martin and the house from 'Psycho'. Collins published the Hardy Boys Adventure Activity Book by Tony Tellarico in paperback 1977, together with a large format colouring-in book. 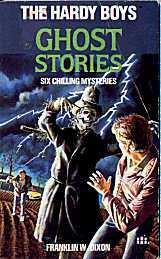 The same print-plates as the American versions were used for The Hardy Boys Survival Handbook (which was published simultaneously with the hardback in 1981); Supersleuths (which was published in paperback in 1983); The Hardy Boys Ghost Stories (1984); and the six Be-A-Detective books (1985-1986). The Hardy Boys Campfire Stories was published in 1986. A paperback edition of Supersleuths 2 was scheduled for 1986 (but since I have not been able to locate a copy, I am not sure if it was ever published). The cover artist of Supersleuths and the first three Be-A-Detective books was the same unidentified artist responsible for all the Format B covers. Several of the paperback titles have been published in 2-in-1 and 3-in-1 volumes. The initial covers were 'cut and paste' affairs utlising various elements from the covers of the named titles, with Format A and Format B/C logos. From 1986, the Format B/C logos were used but brand new cover artwork featured. Format E logos and artwork appeared from 1993. There are three different formats for the CASEFILES series in the UK. As far as I can ascertain, only the first 10 titles were published under the Armada banner. These books were direct printings from the original US plates, but with cropped versions of the American cover artwork incorporating new logos and title captions. From volume #11 (I think), all subsequent titles were published by the London-based division of Simon & Schuster Ltd, under their Archway imprint. The cover artist was Richard Jones (although I do not know how many covers he provided). The US artwork was used from book #61 onwards. A top left corner flash on some volumes announced these books to be "THE NEW SERIES". It is unclear when this series ceased to be published by Armada; reports seem to indicatd that there were only 70 titles in this series. From June 1999, the first of a series of 11 reprints of the CASEFILES appeared under the UK Archway imprint. There was no cover art apart from a psychedelic swirl of colours and black shapes. Four books were released in the first month, with one title each subsequent month, with the last in January 2000. These 11 books contain a "Case Code Clue", which after being decoded gives the reader the answer required to enter into a prize-draw in January 2000 when the last title was released. The 11 titles are Darkness Falls, The Dead Season, Line Of Fire, Disaster For Hire, Scene Of The Crime, Dirty Deeds, Height Of Danger, Real Horroe, Perfect Getaway, Choke Hold and Sabotage At Sea. The last set of hardbacks was published in 1985 through Swift Books, a children's books imprint of Chivers Publishing, owned by Firecrest Publishing Ltd (of Bath, England), who published at least the first four Nancy Drew And The Hardy Boys Be-A-Detective puzzle stories in hardback. The American printing-plates were used, but with new cover art. The artist's name is not known. The logo of these books is based on the American editions, complete with the symbol of the three faces in silhouette. Chivers apparently also published Supersleuths 2 in hardback in 1986. Granddreams published the popular range of Christmas Gift Books and Annuals based on popular television shows. 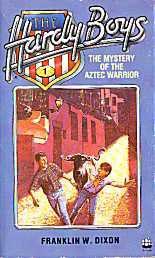 Two annuals based on the Hardy Boys / Nancy drew Mysteries TV series were published, the first in 1979, the second in 1980. The Annuals each contain a mixture of strip stories, games, puzzles, pin-ups and profiles of the actors, illustrated with photos from the TV series.